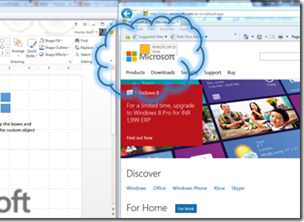 This is the first blog post on tips or tricks for MS-Office by me and am excited to start this series, but it may not be a series of post that you get everyday. When ever I come across a new features or some interesting things to share I will just summarize my learning here. I consider all my blog post as my personal database of my learning and for future use. It may or may not help you and all the blog post are just my learning , there may be better idea and process or option which you can go for. Feel free to read and think before you implement if its useful. Most of the time we get confused (am for sure) during color selection for a logo or a picture we saw somewhere say in a website and we need the same color for our logo. 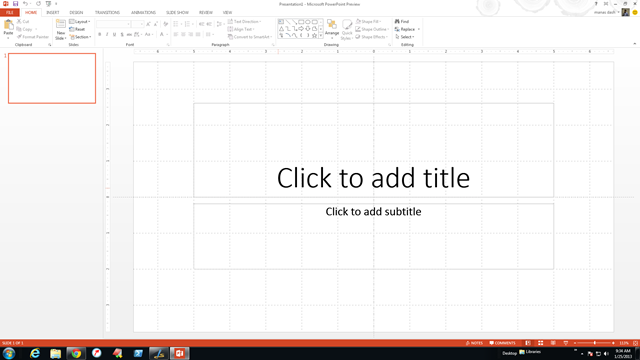 So today we will take the help of Power Point and one of its new feature “eye dropper” which can be found form the format menu. 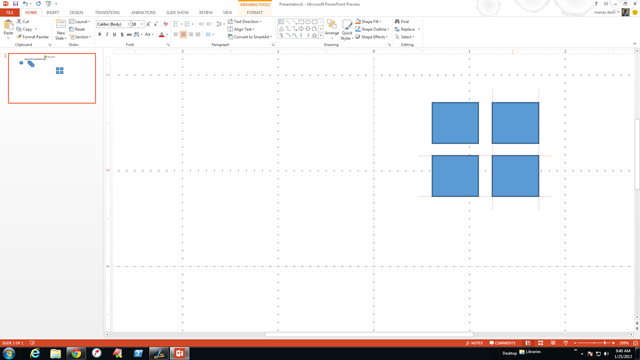 So start Power point 2013 and then take those four square (from Insert menu and select shape). 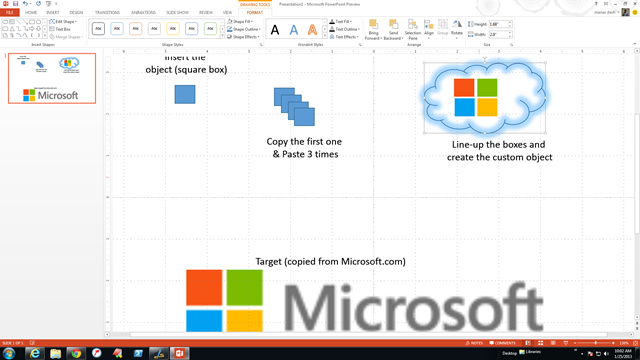 Now when you copy and paste the first square and create other three you can see those are not in proper order and alignment with each other as required). 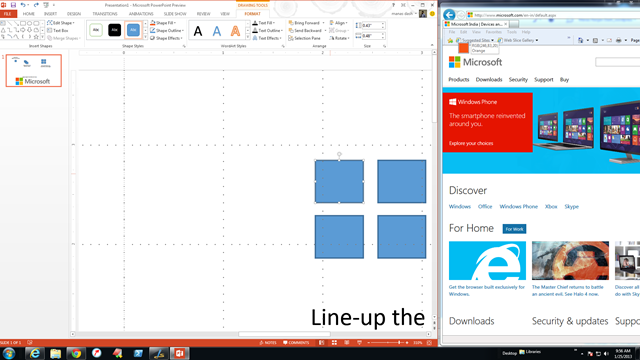 Even when you organize them in order Power point will help you by providing exact line-up from all the possible ways (Line-up and space objects equally). You can see those horizontal and vertical lines while moving the object and placing them in line-up with other. Now you got the four square, its time to choose the color, look at the color at your target image. You have to decide the exact color, say for the first box whether its Orange…no its a red.. I think its a mix of orange and red. Oooopss!!!! Don’t worry lets ask Power point. 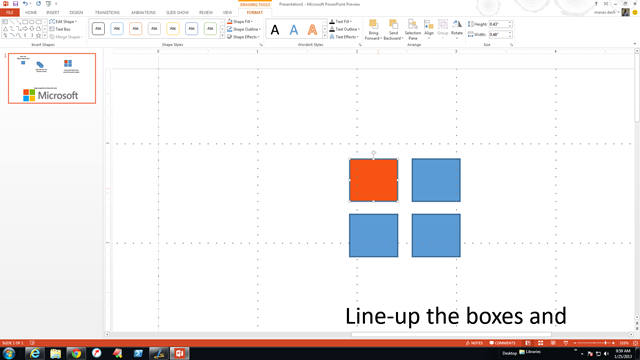 Select the First box, Go to Format – Shape Fill and select Eye Dropper. Now with out releasing the left mouse button go to the Internet explorer and click the first square in the Microsoft Logo(which you have opened already as www.microsoft.com). 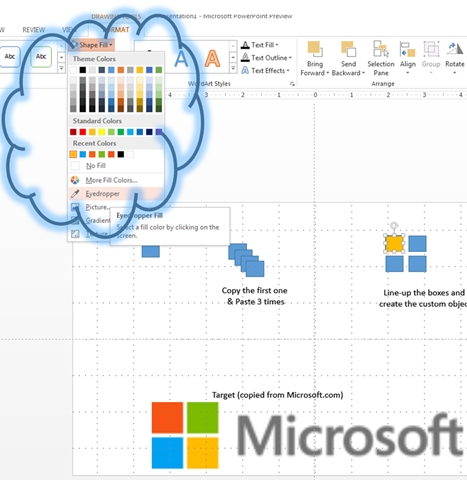 Immediately you will find that your box (part of the logo) in Power Point is filled with the color that you selected from the website. Now continue the same for all the four boxes and and the design is ready. You can select the borders to none from Shape Out line. Once you are done with all the finishing touch your logo is ready. 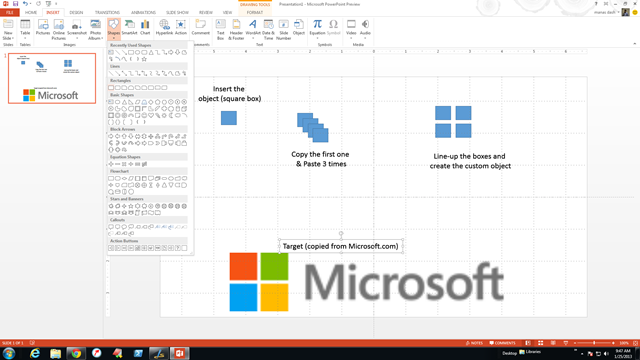 If you want save the same as a png or a jpeg format and you have one image ready. Now choice is yours whether you want to design something with all the colors in the world 🙂 . 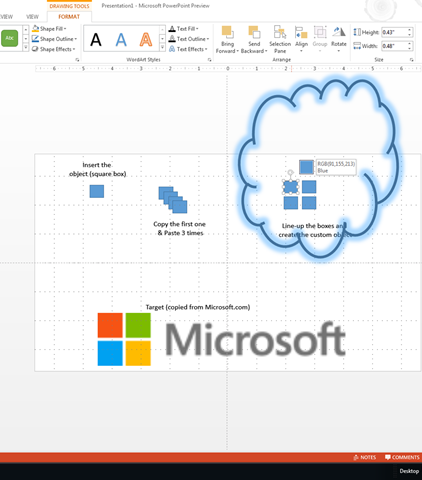 But Manas, this feature is not in ms-ppt 2007, i suppose….